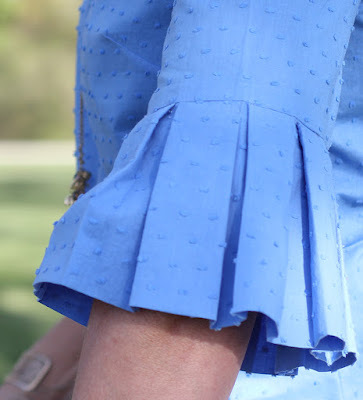 The sleeve for Spring 2017 seems to be the trend to have and I am jumping right onto that trend with both feet arms (in this case). 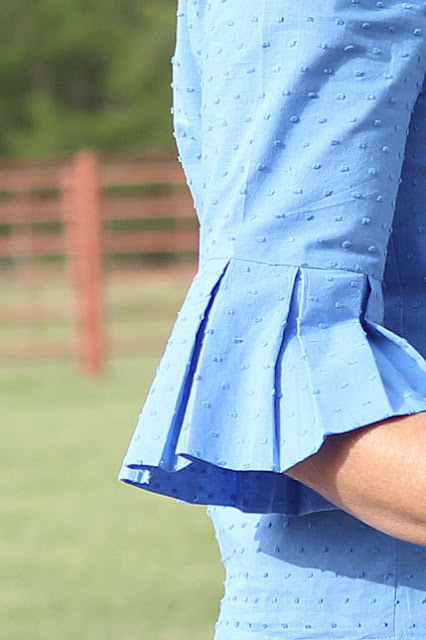 I just want so many of these looks and styles, which means I will be busy sewing statement sleeves all summer long. 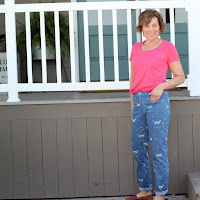 For this look, I went with Mood Fabrics’ Dotted Cotton Voile (sold out) but there are several Mood Fabrics’ Voiles in stock or you can look at Mood Fabrics’ Dotted Swiss for the texture of my blouse. 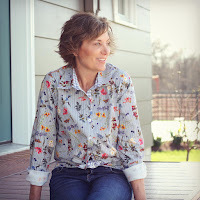 On another note, Amy used this same fabric for a blouse she made for Mood Sewing Network. One thing I did do on the sleeve was to measure the pattern piece for the pleating and then drew lines with my Frixion pen on the wrong side of the fabric. 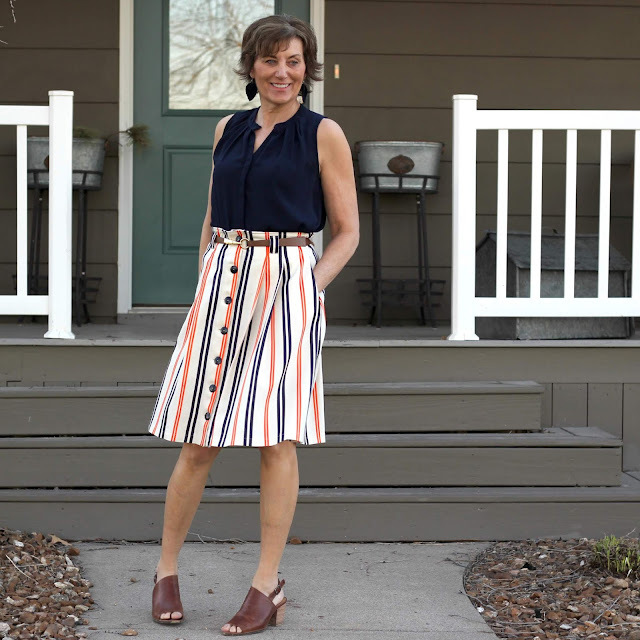 This really helped keep by pleats straight and even. I pinned it all in place and then took it to the ironing board to press the pleats. I sure didn’t want those lines to disappear before I was done getting all those pleats in place. 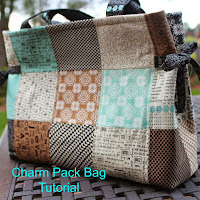 This pattern has a separate cup size pattern piece for A/B, C and D, which is a great feature. I went with a size 12 and a C cup, using the longer length and adding another inch to the length. My only issue with the pattern is I think it is quite close fitting and seems to have a close fit at the bottom. I find it just a bit hard to get on and off! Here is the back with a small opening and I used a hook and eye closure. This would be cute with an exposed zipper also. 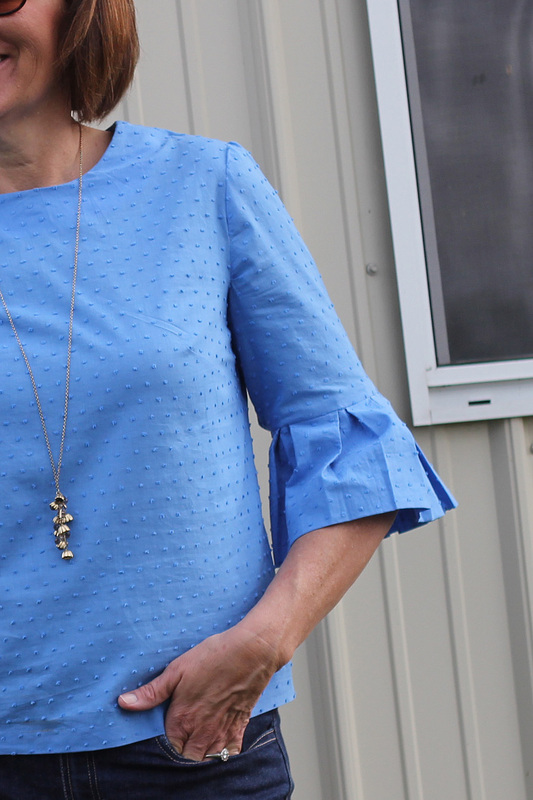 I loved sewing this fabric, it pressed beautifully and the pleats held nicely on my sleeve. One change I did make was to use a smaller seam allowance on the upper sleeve., I found it too be too tight in the upper arm. 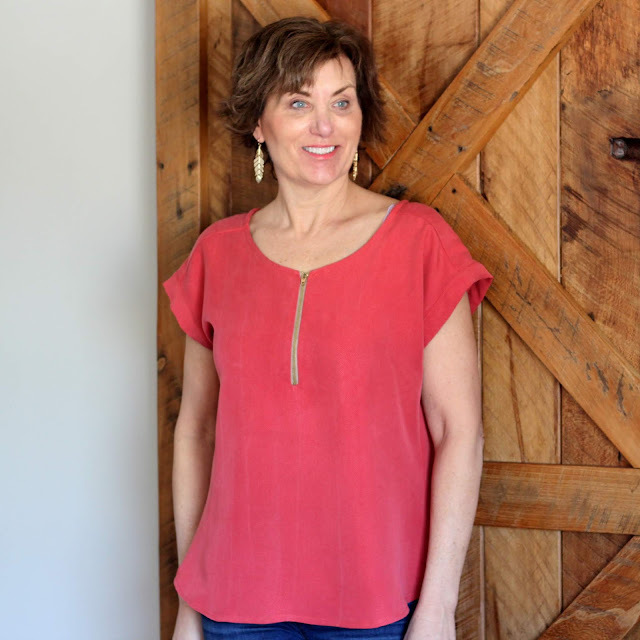 I am so excited to have this top made in the Mood Fabrics’ Voile, it will be perfect for our hot and humid days. 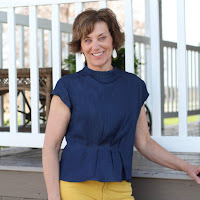 Another point about the voile, it seems perfect for this top, nice weight and drape. This beautiful dotted cotton voile was destined to be made into a great top and I love the look of the pattern and fabric combination. It is always such a happy moment and good feeling when these two elements come together for a fantastic garment. 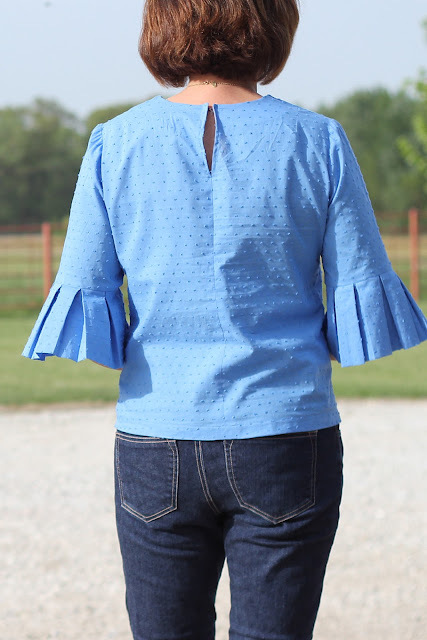 On another note - I was planning on making another one of these in View A but my fabric was just too stiff, the blouse became a wadder. 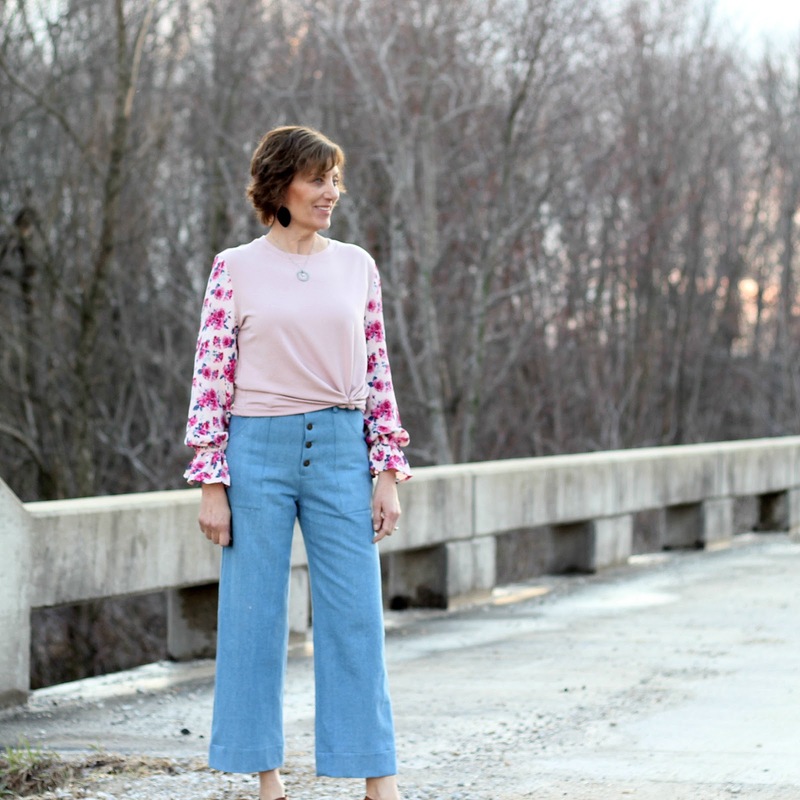 The fabric was a cotton poplin and it matched perfectly to my embroidered jeans. 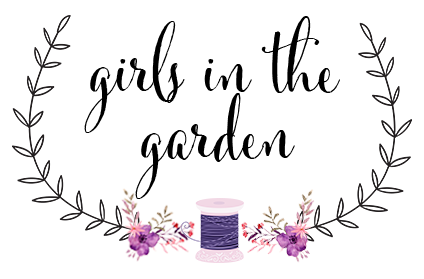 So lesson to pass onto you - soft fabric, drapey fabric for this pattern! Finally I can comment... pretty top and loving all you have created. Thanks, this is a fun pattern. Great color and style!! You did a great job as usual!! Thanks, I am so happy with this look and the fabric. I ADORE this color and the dotted fabric. 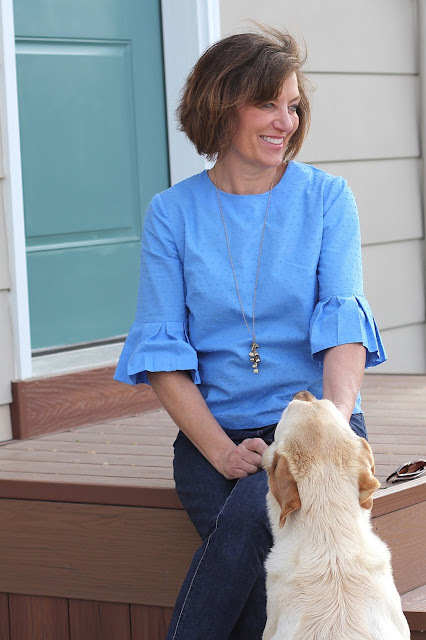 I bought JCrew's style of this blouse about two weeks ago. The ironing of the fabric (after washing) is about to drive me nuts. I usually just put on a good show and get my ironing done quickly but this blouse.... I would trade mine for yours in a heartbeat! Great job. Thanks so much, it is a nice fabric. Those sleeves, they are joyous. thanks, the sleeves are great. 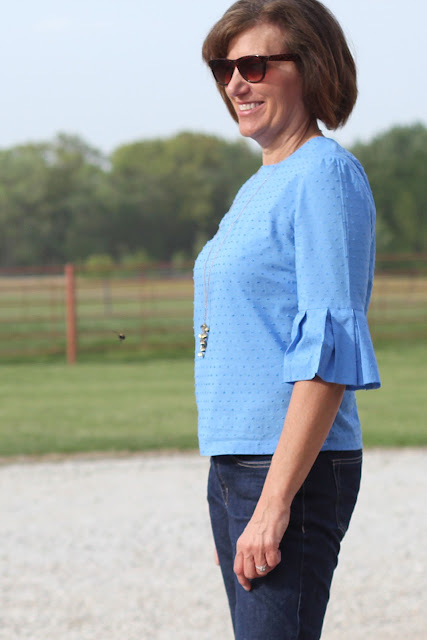 Such an adorable top on you Lori! I too am working on making up this pattern but using the version with the flounces. Fun! Another winner Lori! Thanks for the tips on the sleeves being tight and I also think that an exposed zip would look great! Love the color of our fabric! Top looks great! 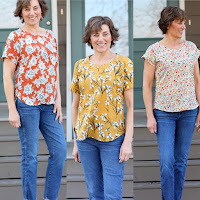 Thanks for the sewing tips as I have this pattern and hope to get a top made. Hi Lorie, did you add length to the sleeve? 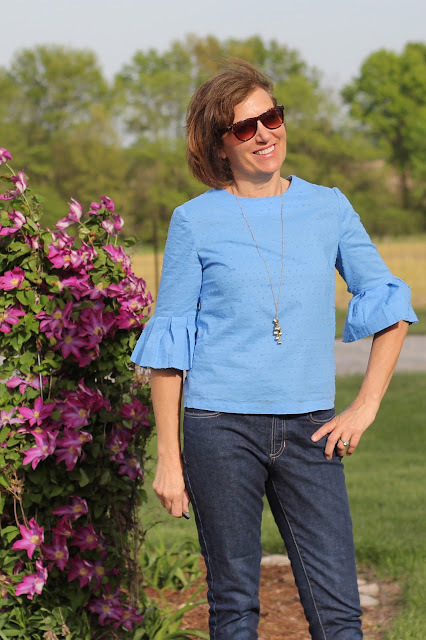 The pattern shows a shorter sleeve ( looks that way!) before the start of the pleats and I see many length variations in people's makes.